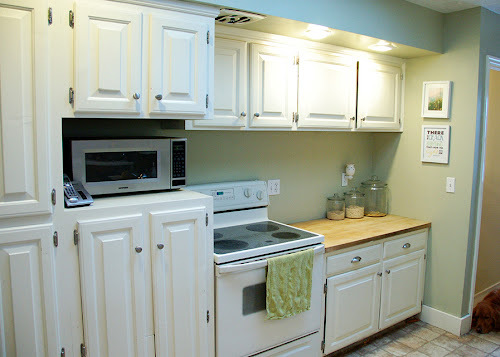 Last week, after what felt like an eternity, I finished painting my kitchen cabinets. I am so relieved to put this project behind me, especially considering how much more painting I still need to do in this room. Let's not talk about that right now though, I'm still in my happy place. It looks like a subtle change on the screen, but I swear it's made a big difference in person. The entire room feels so much brighter. It matches the color scheme of my house now, instead of being a big off-white sore thumb of a room and a testimony to thinking paint colors through carefully and in context with the bigger picture of a house's design. See? Totally worth painting. 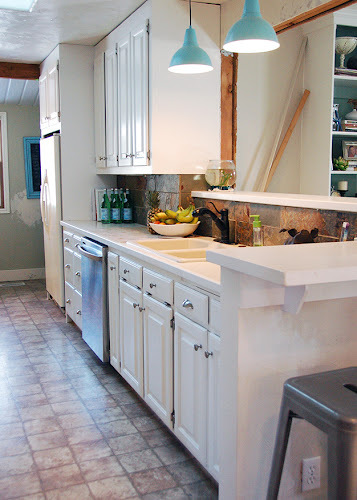 The previous color ended up looking dingy and dim when surrounded by all the crisp white trim of the other rooms that my kitchen is now wide open to. 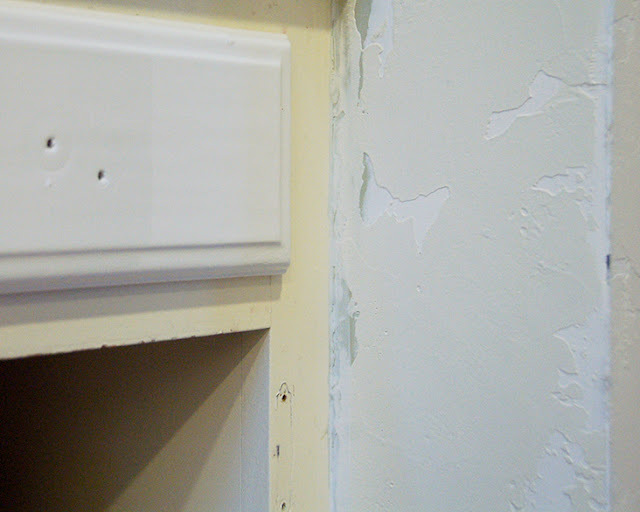 The halfway unpainted box is where our new over-the-range microwave will go and not match my bisque-colored oven. Instead of adding wine storage to the space where the microwave was previously, you can see that we created a sort of coffee nook. Because that space is between my range top and the weird cabinet-covered heating duct, I decided it was too warm for wine storage. Improvise, adapt, overcome. That's what I say... when I'm writing blog posts. I'll be back tomorrow with details about the paint and the process! 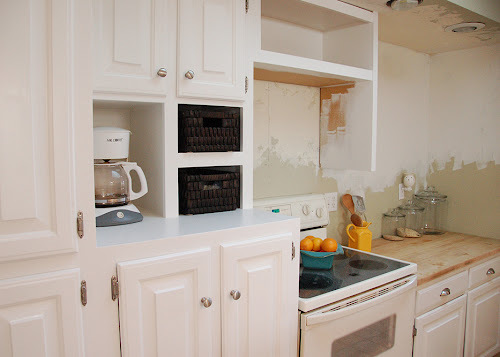 Update: Learn about the paint I used and read my tips for achieving the best finish! I can't wait to see the finished kitchen! Love the direction it's going and I totally get the importance of the right color...I've been agonizing over what color to paint our cabinets. Btw...I don't like appliances on my counters either! 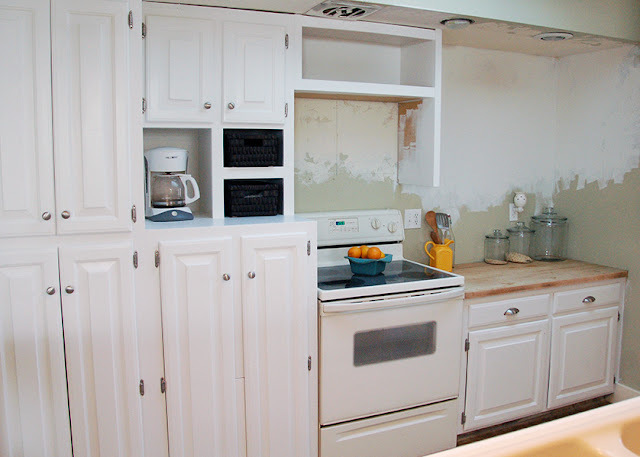 When you start your remodeling project, you will find out that the cabinets take up a huge percentage of the budget and design space. RTA cabinet is just a basic cabinet which may be picked up or can be delivered from the local neighborhood retailer.